This was a project for my TCP/IP Networking class which required implementing a TCP server and client for the game Uno. 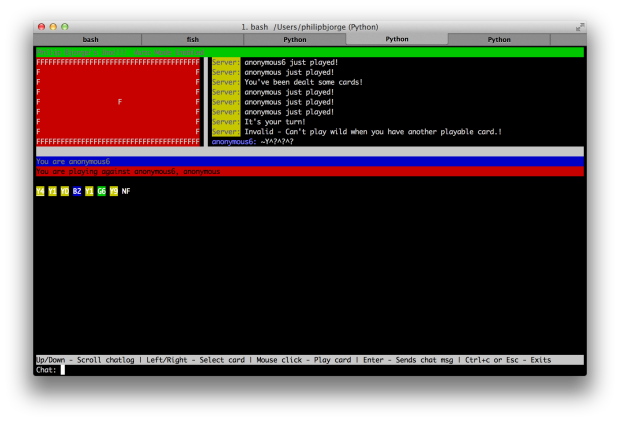 I wrote a server application in Python (which contained all the game logic) and two thin-clients using Clojure + Seesaw and Python + Blessings. The most interesting aspect of the application was working with Curses/Blessings to create a textual user interface. The TUI supported scrolling through the chat log, selecting cards with the mouse, and sending chat messages. I look forward to creating more streamlined TUI apps in the future.